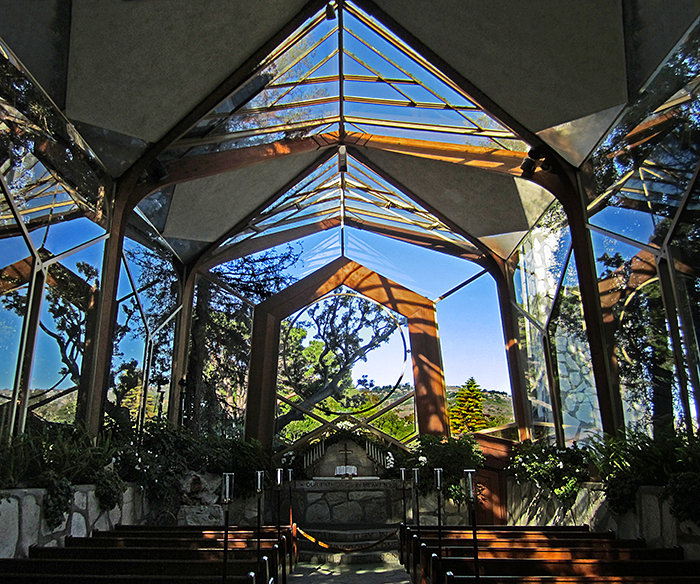 Located on a knoll overlooking the ocean at Portuguese Bend, the “Glass Church” was designed by Lloyd Wright, architect and son of Frank Lloyd Wright. Built as a national a memorial to 18th-century scientist, philosopher and religious reformer Emanuel Swedenborg, it was designed to serve as a chapel for meditation and prayer for wayfarers. The edifice, constructed of redwood, glass and local stone, was built in 1949-51. The consistent use of the triangle throughout the chapel; building and grounds is intended to be symbolic of spiritual values. The huge, circular glass panes also convey spiritual concepts. A Visitors’ Center connected to the Chapel by a colonnade houses a large Bible diorama designed by Lloyd Wright, exhibits of Swedenborg’s contributions to religious thought, and a library of Swedenborgian literature. Gardens tastefully landscaped with flowering shrubs and evergreen trees enhance the magnificence of the setting. Planting in the cloistered garden is representative of many plants and shrubs from the Holy Land. The chapel and gardens are open daily from 8:00 AM to 5:00 PM, but it is suggested that you call before visiting, as it is a popular site for weddings. Visitor’s Center is open daily from 10:00 AM to 5:00 PM. Admission is free.